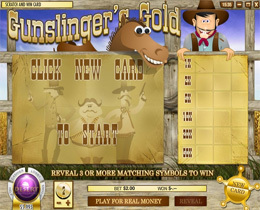 Gunslinger’s Gold is a “Wild West” Themed scratch card game, in the form of a 2×3 grid, giving you six panels to uncover. The background is animated, with a cowboy chewing on some straw and his horse looking at you while blinking his eyes. Before you start you need to choose your bet amount first and players have the following options: $0.01, $0.05, $0.10, $0.25, $0.50, $1, $2, $5, $10, $25 and $100. It is recommended that players who are new to the game, stick with $1 or $2 per game, but some people prefer to bet big and are usually the big winners and know the game well. To start playing, click the “New Card” button and you will start a fresh scratch card. Move the mouse cursor around the card as if your cursor is the coin you are scratching with. As you scratch, a scratching sound effect is heard. A cowbell sound will be heard for every value you reveal. For each value players uncover, a man will appear in a column on the pay table, if players get three men in a row then this means they win! A great effort has been made within the scratch card game arena with Gunslinger’s Gold as the whole presentation is exceptional for an online scratch card game.